File Commander 2.0 free download. File Commander will help you save time when organizing the files on your disk. File Commander will help you save time when organizing the files on your disk. If you find that you're moving, copying, or deleting the same files over and over, you can use File Commander to make a simple command that does it for you. 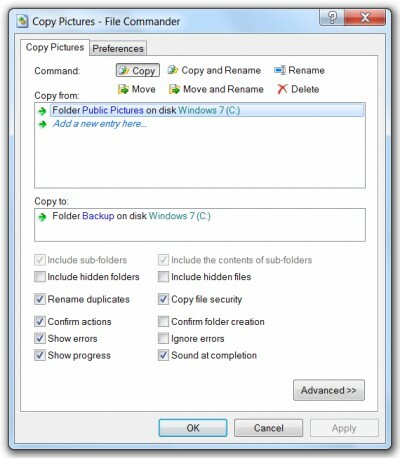 When you run the command, your files will be moved, copied, or deleted just as if you'd done it yourself. File Commander includes a Wizard for creating new commands, with easy step-by-step instructions. There are no scripts to write and no technical jargon to understand. use the File Commander Wizard to build the command. choose "File Command" and use the File Commander Wizard to build the command. Talking Alarm Clock makes your computer to remind you of important dates and events. What's Where is a simple software for keeping track of your stuff. Panel Commander is very clear and simple to use. Wincmd Directory Menu Customizer (widimec) is a tool you can use only to customize the Directory Menu of Total Commander (previously know as Windows Commander). EF Commander Free is a file viewr/manager for Windows OS. Total Commander Menu Editor is a tool using which you can modify your TC menu or create a new one from scratch. SendTo Commander is a free software which allows you to take the full control of your SendTo right-click menu and customize it by organizing better its shortcuts.